One of my supervisors and I were discussing what we noticed about students when we hosted an informational table inside our university’s business school. Our goal was to advertise for our upcoming Career Fair. As we spoke to students in passing, we noticed there was a particular type of student meandering in and out of the building: the cell phone student. These students had their eyes glued to their phones in the palm of their hands and avoided eye-contact with us – as if we could pass on a communicable disease through eye-contact. The cell phone students are my favorite students to bug! Some may think that I’m too out there, but I enjoy letting students know about future events on campus. I want students to feel included and know that I care that they at least know there’s a Career Fair on campus. I began this post with an anecdote because I think it speaks to a problem many Student Affairs professionals face in generating involvement in programs and activities. Specifically, programs that push a student to do activities outside their comfort zone. 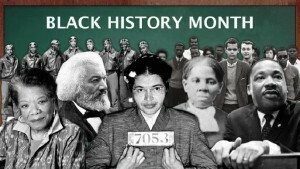 February is Black History Month (BHM). Did you know that? How many special programs can you think of that your institution has hosted already or plans to host as the month comes to a close? I’ll admit: I only know of the ones that come through our daily university email or from a student organization advertising on social media. When I see the advertisements for a BHM event, I study it for a couple different things. Mainly, I try to view the advertisement from the perspective of both an #SAGrad and as an undergraduate student. Similarly, I look to see how much effort goes into enticing members of different backgrounds, different cultures, and different races to attend said event. My conclusion is that we have some work to do. Help plan or oversee different events on campus and consider how we go about making students feel included. Demonstrate that one does not have to be Black in order to take part in events connected to BHM. Emphasize the value in experiencing “new things” and becoming a participant in activities that will enhance our view of the world. Celebrate open-mindedness and an appreciation for the wide variety of cultures present on a college campus. They are a microcosm of our society. Many of us are in this profession – or at least making our first leap into it – because we are open-minded and we already care about students’ academic, personal, and social development. I still can’t help but consider how important inclusion is to a month like BHM. Anyone can celebrate and observe BHM as long as they feel involved. It’s on us to help get them there. The question becomes how you – as just one person – can help students from different cultural backgrounds participate in BHM activities. The first step is easy: become informed. Learn about BHM yourself so you can help others learn about it. Show others your interest in BHM so they too may become interested. We’re all capable of being leaders. If we can educate one person who may otherwise shrug off BHM and show that we care, then perhaps they’ll begin to care too. Black History Month is exciting! It’s an opportunity to connect with your friends, peers, colleagues, and classmates. It’s a chance to take in aspects of a culture you may be unfamiliar with. You may even try new foods. None of this would be possible, however, without effort. If we take initiative to become included in a culture’s celebration other than our own, we’re taking the first step for others to follow. Alexander Moylan is currently a doctoral student at the University of South Alabama studying Instructional Development and Design. This past May, he earned his M. Ed. in Educational Leadership and Higher Education Administration. He completed his B.A. in English at Eastern Connecticut State University. Alex’s passions include writing about issues related to student affairs in higher education, both in Alabama and nationally. Connect with Alex at @AlexanderMoylan on Twitter.